Offers protection following cerebral ischemia, damage to the brain or nerve tissue. Our dietary supplement is formulated from alpha-lipoic acid which is also known as thioctic acid. Long-considered to be a vitamin, alpha-lipoic acid is actually a coenzyme which means it plays a role in several biochemical reactions in the body. It is involved in processes essential to healthy body function such as production of energy by cells. Since it was discovered in the 1930s, alpha-lipoic acid has been the subject of numerous scientific studies which have revealed its potent antioxidant effects. Some scientists consider it one of the most powerful antioxidants currently known. Its antioxidant activity is particularly beneficial for fighting oxidative stress and the harmful effects of free radicals which are responsible for cellular ageing. In addition to this protective effect, alpha-lipoic acid is able to regenerate endogenous antioxidants. This means it helps boost antioxidant activity within the body by preventing the destruction of powerful natural antioxidants including vitamins C and E. In certain cases, alpha-lipoic acid’s action can prevent these two antioxidants from being broken down. That’s why it is ‘sometimes referred to as the ‘universal antioxidant’ or ‘hyper antioxidant’. With its natural antioxidant potency, alpha-lipoic acid offers significant therapeutic potential. Extensively-studied in recent years, it is now used therapeutically as a neuroprotective supplement, particularly as part of medical treatment for patients who have suffered cerebral ischaemia, or damage to the brain and nerve tissue. In Germany, alpha-lipoic acid is also used to treat neuropathy. Characterised by pain in the feet, legs and hands, neuropathy generally manifests in patients with severe diabetes or in alcoholics. Beyond the neurological sphere, alpha-lipoic acid may also offer benefits for treating, amongst others, liver disease, cardiovascular problems and inflammation. It may also be valuable for detoxifying the body, especially in the case of heavy metal poisoning. Our dietary supplement is formulated from the form of alpha-lipoic acid called R-lipoic acid. There are actually two forms: S-lipoic acid and R-lipoic acid, both of which are naturally produced by the body from the amino acid cysteine. However, R-lipoic acid is only produced in very small amounts which is why our supplement has been formulated to provide an optimal intake of this molecule. Offering 100mg of R-lipoic acid per capsule, the suggested dose for this product is two to three capsules a day, though this can be adjusted in line with your needs and the advice of your therapist. You may also be interested in N-acetyl-cysteine, an excellent precursor of another potent antioxidant, glutathione. Other ingredients: maltodextrin, silicon dioxide, magnesium stearate. 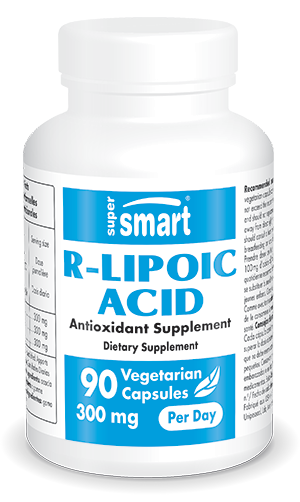 Each vegetarian capsule contains 100 mg of R-lipoic acid. Take two or three capsules a day, or as advised by your therapist.